Paris, Galerie Templon, De Kooning, June-July 1984, no. 18. D/usseldorf, Hans Strelow Galerie, De Kooning: Bilder, Sculpturen, Zeichnungen, September-October 1984, no. 18. Milan, Studio Marconi, de Kooning: dipintin, disegni, sculture, March-April 1985, p. 38 (illustrated in color). Bay Harbor, Gloria Luria Gallery, Highlights of Twenty Years, February-March 1986. 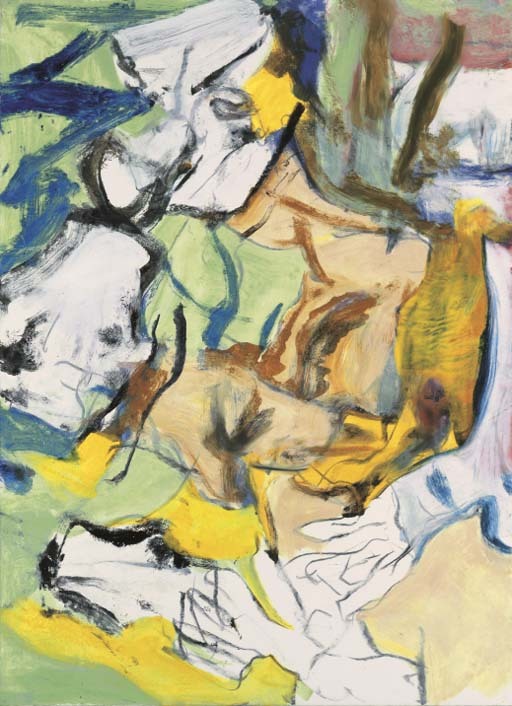 Willem de Kooning's Untitled is a dynamic painting from 1977, executed at a time when the artist was combining images of large scale figures with landscapes. Although the artist had combined these themes in the past, by the 1970s their integration was complete--the landscape has broken through the figure's contours and actually entered the body. Dissolving the figure/ground dichotomy, painterly passages of tan and orange tones evoke both the beach and flesh; blue streaks conjure up bodily contours as well as bodies of water. The figure takes up most of the composition, with white passages at the top standing in for a head and "hands" joined together at the bottom. The sensuous curvature of the neck and shoulder is beautifully articulated with brown and blue strokes, which is located above the fleshy colored area towards the upper right corner. De Kooning moved to East Hampton in 1963 and would live there for the remainder of his career. The artist was impressed by the natural light of his new surroundings, creating art that was brighter in coloration and looser in brushstroke. "The East Hampton paintings of the 1960s and 1970s demonstrate that de Kooning, unlike most of his New York School colleagues but in the rare tradition of such masters as Monet and Matisse, has produced a great and innovative late body of work...the East Hampton paintings convey the sense of the ocean. The hermetic space of New York is replaced by the atmospheric play of light as it bounces off the water" (D. Waldman, Willem de Kooning, New York, 1988, p. 136).